Isn't it insanely cute? 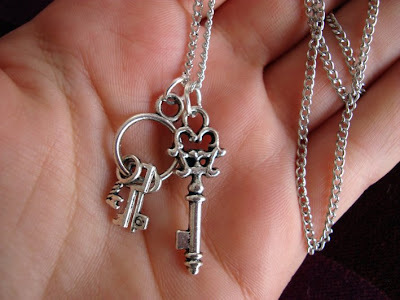 I've always wanted key pendant, but four miniature ones are so much better! 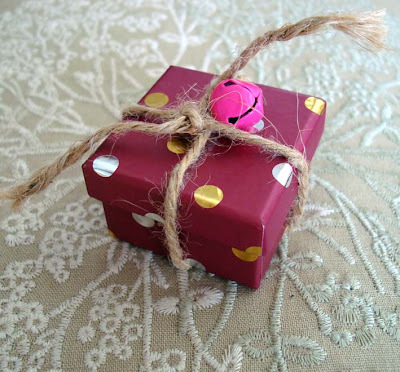 And, to tell you the truth, I felt a little ashamed of my own gift-wrapping technique... Girl can seriously do packaging! Thanks sweetheart! Stop by Laura's blog to see more of the beautiful jewelery she makes, like my other favourite of hers, the "I love tea" necklace, complete with a miniature teaspoon. http://uk.myspace.com/fashion to vrika sto myspace kai nomizw oti s'endiaferei. How lovely! What a sweet, generous reciprocal giftie. adorable and touching a the same time! so sweet, both of you! it is nice to see this kind of relationships developing between bloggers, there is life outside the net after all. Love the new necklace! Sweet charms. You take such amazing pictures! And I'm so happy you got it and like it! =) I have my tree of life on today, it makes me happy! Cute! Can't wait to see them worked into one of your FAB outfits! Also, I blog awarded you today! 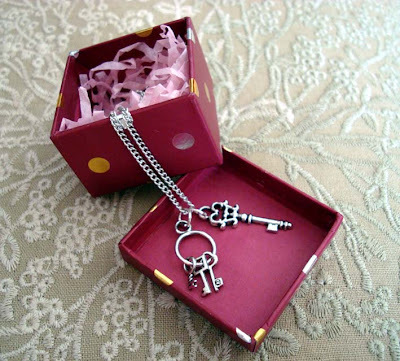 The package seems just as great as the necklace!